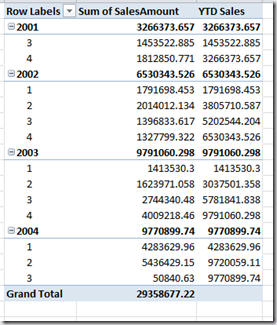 With the release of the latest CTP of PowerPivot, DAX has gained a lot of new functions (mostly to do with time calculations), so over the weekend I decided that it was time to sit down and start learning it properly. A lot of other people out there are doing just the same thing – Vidas, for example – and like them I thought I’d blog about my experiences while I was checking it out. So far I agree with Shaun Ryan that anyone with a background in MDX will have an advantage when it comes to understanding DAX, but there are as many differences as there are similarities and it’s still a bit tricky to understand what’s going on. I would like to point out that the code here doesn’t necessarily represent best-practice for DAX (I’ve only been using it for a short time, remember!) and in some cases the code will have to change before RTM because DAX itself will change; hopefully, though, these examples will help anyone else out there who, like me, at the bottom of the learning curve. 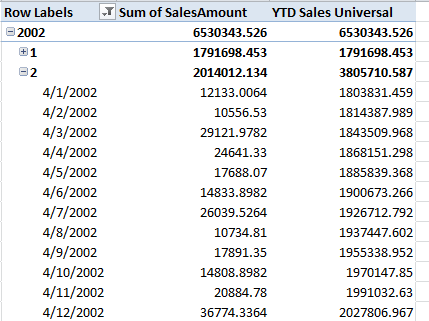 In all this blog post I’m using a very simple PowerPivot model based on the DimDate and FactInternetSales tables from the 2008 version of the Adventure Works DW database, with the two tables joining on the OrderDate key. , All(‘DimDate'[FullDateAlternateKey]) – which is an extra filter condition that just needs to be there to make things work. If it ain’t there, the calculation won’t work, but it doesn’t really serve any purpose and it won’t need to be there at RTM. Howie Dickerman of Microsoft pointed this out in his session at PASS earlier this month and if I hadn’t picked up this tip I’m sure I would have got absolutely nowhere with DAX by now. 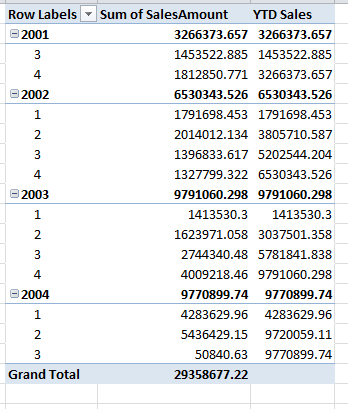 Various other similar approaches didn’t work, though, and the obvious next step of using LASTDATE(VALUES(‘DimDate'[FullDateAlternateKey])) inside my original calculated measure didn’t work either. Given that PowerPivot doesn’t allow you to hide calculated measures (another thing that, in my opinion, needs to be fixed before RTM – breaking up calculations into smaller steps is a useful thing to do for debugging and sharing code) I don’t particularly like this two step process. I’ll post an update here when/if I find a way to do this in a single calculation; if anyone else out there finds out how to do this, please leave a comment! It\’s interesting to note that, if you select more than one year (moving Year on a slicer, for example), the YTD will be always the one of the last year in the selection. Used to MDX like I am, this seems strange and non-intuitive at first, but maybe users will prefer (and understand?) this behavior. 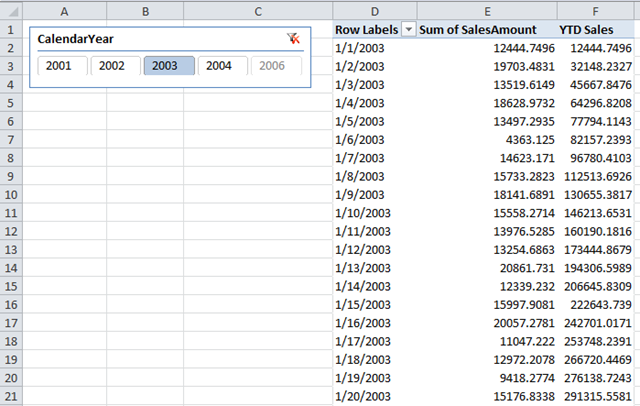 Sorry to ask the obvious question, but what type has PowerPivot given the FullDateAlternateKey column? So, being a DAX newbie, I am getting confused with syntax left right and centre. I keep seeing people showing code FullDateAlternateKey and DimDate in various examples. Since I\’m not a programmer nor Access trained, can I assume that those are referencing tables / rows and can be named anything? Reason being as I\’ve seen a posting where someone said for the current release all Date/time functions had to include (for his example) All(DimDate), so I was unsure if it was the All that needed or the All(DimDate) or some odd combination. I\’m just trying to sort out orders by InvoiceDate. No Dimdates, no Dim entries, no Alternatedate keys, no programmer par for the course syntax or labelling defaults. So how should it read in the real world? 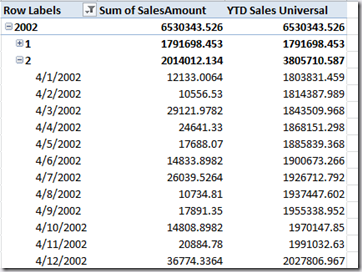 John, in this example FullDateAlternateKey is a column and DimDate is a table; both come from the Adventure Works DW sample database for SQL Server. So yes, you\’re right, you can use your own column and table names instead, including in the All() function. Thanks a lot for sharing this. I encountered the same issue and found a different solution. Obviously I have a different Time Dimension, including a month start date. Day equals your FullDateAlternateKey. With these I could have 2 levels in my hierarchy, for a third level you have to nest again. Your solution is better, because there is no need for that. Just would like to share, because it took me also a while to figure it out. 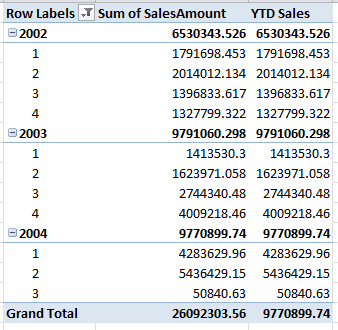 I had exactly same difficulty with understanding how to work with TOTALYTD and got it resolved using hint from your article -> TotalYTD(Sum([SalesAmount]), ‘DimDate’[FullDateAlternateKey], All(‘DimDate’)). Thanks a lot!